With the coming of a new year, it seems habitual to take stock, so let's explore the outer limits of the collection's back forty, and round up ten prize-winners that may give you an idea of the extremities of our artifact holdings. A pair of souvenir coins that commemorate the August 9, 2003 christening of the latest ship built by Bath Iron Works, the USS Momsen (DDG-92). This is our 36 ft. bow section fragment of the 1851 Maine-built clipper Snow Squall, salvaged in the 1980's from its final 1864 grounding in the Falkland Islands. 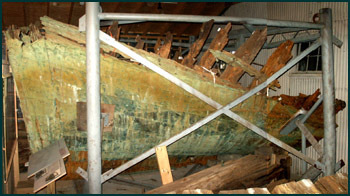 Though it is large enough to be housed in its own exhibit building, our copper-plated remainder is but a tiny portion of the original 157 ft. vessel, as seen (below) in this model. Your choice here. It often seems that the smaller the object, the greater the meaning behind it. The painfully small letters of these service pins read (l. to r.): United States Coast Guard Reserve, American Red Cross Life Saving Service, and U.S. 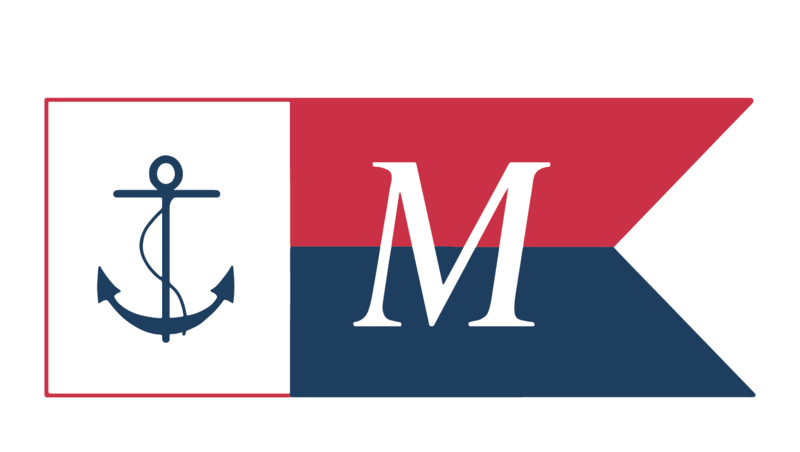 Naval Reserve Honorable Discharge. 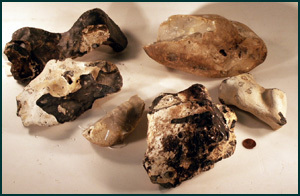 Very different in its creation, but just as potent a symbol to its wearer is the carved Inuit ivory seal fetish. 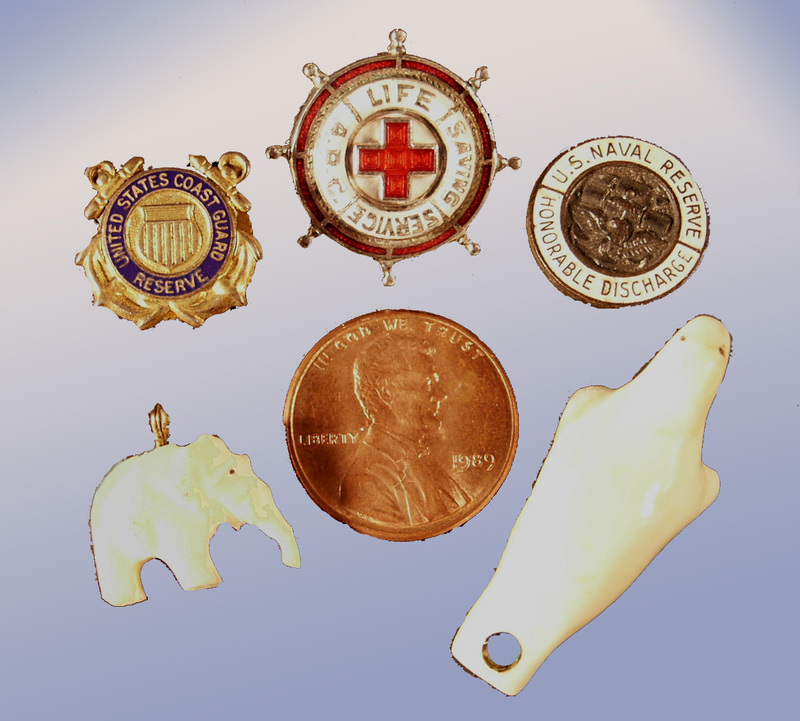 The little ivory elephant we're calling a watch fob, though it could easily have been part of a charm bracelet. Heavy things abound in our collection; large wooden 19th century ships involved large pieces of metal, whether anchors, pumps, steering gear, or engines. This compound steam engine gives good weight; it filled the two-story high engine room on the steam tug Seguin, Bath-built in 1884. 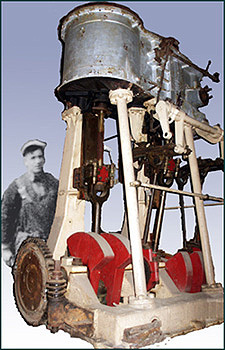 19th century steam engine pressure was contained not by welded seams, but by castings that were assembled and held together with mechanical fastenings, usually with nuts on threaded bolts or studs. These gargantuan (50+ lb.) 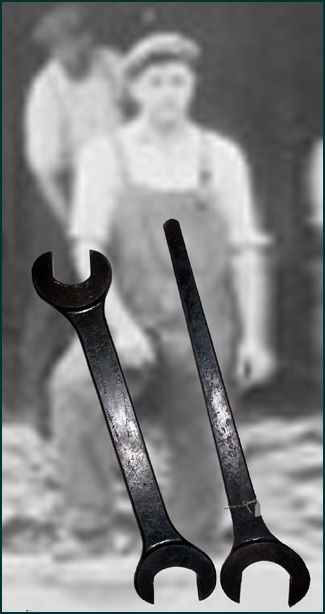 wrenches were for tightening the very large nuts used on such very large engines and their boilers, like Seguin's, above, or even larger. Note the convenient double-ended model that would save you from running back for the correct size. 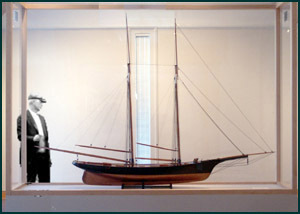 This beautifully scaled schooner yacht, City of Bath, is a 'pond model'. It was meant to actually sail in the water. 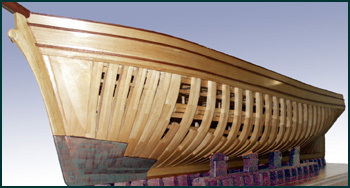 Built for the 1876 Philadelphia Centennial exhibit by a Bath shipyard owner, it occupies our largest case. When under full sail in the river here, it proved faster than the two men in a rowboat who were tending it. In a nutshell, here it is. 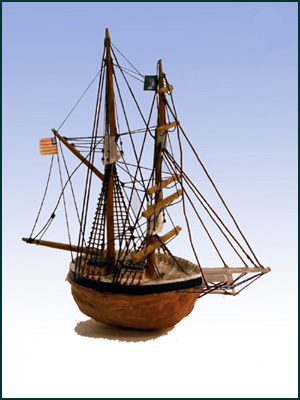 This brigantine-rigged walnut also sports our smallest American flag. "Who's the baby?" 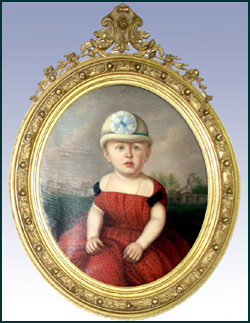 This child's portrait always grabs the attention of every third-grade class that tours our painting storage area. Surrounded by sober portraits of ship captains and dramatic shipwrecks, this colorful, yet somber youngster with the amazing hat rivets anyone under the age of 12. When it is revealed that this is a little boy ("In a dress!?!? "), this brings the house down. The hilarity usually ends when it is further revealed that poor little Charlie Bishop, son of a local sea captain, died age 11 yrs., 6 months, and was buried not far from the Harpswell homestead visible in the portrait's background. 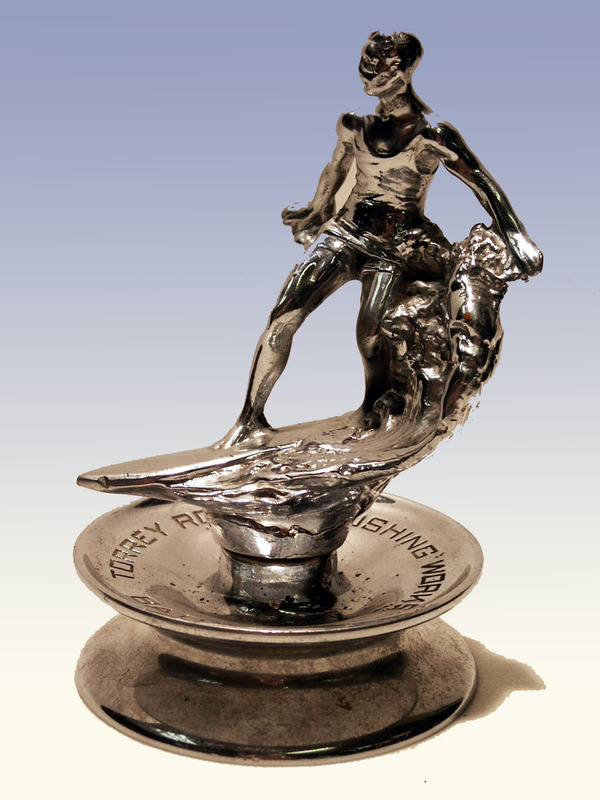 The lettering cast around the base of this statuette reads, "Torrey Roller Bushing Works, Bath, Maine." Established in 1869 to cast the metal parts of the hundreds of blocks (pulleys) in every rigged sailing vessel that left Bath, the Torrey foundry thrived. And like many Bath marine businesses, it gradually declined with the dwindling of the age of sail, to finally fold in 1964. This trophy was probably from the twilight years of this venerable firm, reduced to casting silver surfers and mounting them on leftover pulleys.